People crowding the pooja pandals around Kolkata, the suburbs and across India, might be surprised to know that around 4000 idols of Durga are created in the 450-and-odd narrowly built workshops or studios in Kolkata’s Kumartuli, the hub centre of idol makers whose idols of Durga, her four children, her lion and Mahisasura travel across the world. This cottage industry, also scattered in different parts of the city and the state of West Bengal, continues to be a space dominated almost entirely by men. Women, born or married into the families of these potters/artisans, are not encouraged to join the trade. In some families, the girls and young women are stopped from becoming idol makers just because they are women. So, at the most, we have not more than a dozen women who have broken all barriers not only to become idol makers but have also flourished in the business through courage, conviction and commitment. Among these less than dozen women artisans, three or four have gained prominence through the media while the rest continue to remain invisible to the rest of the world. The media highlight has begun only since 2011 though some of them have been crafting beautiful idols of the Mother Goddess and her family for around two decades. During the Puja season, the male artisans hire extra hands from across Bengal because making the idols of Goddess Durga is a grand affair. But they do not want women “invading” their space. They do not express this in so many words but action proves their stand. Fortunately indirect channel of ‘encouragement’ has come through the back door from an unexpected quarter. Many of the artisans’ sons who are born into this hereditary trade are unwilling to take on the family craft creating oppurtunities for women stepping into this world. The name Kumartuli or Kumortuli has its origins in the Bengali ‘kumhor’ or potter, and ‘tuli’ or small space. It is as old as the city of Kolkata, reportedly created by the East India Company by building settlements in a few scattered villages. New neighbourhoods came into being and were dominated by a specific trade or craft. Kumartuli’s unique workshop area in the older section of the city has become a tourist hub. Today, entry tickets have been introduced to regulate the pre-Durga Puja rush. Travel operators offer special curated packages only for Kumartuli. Mala Pal, China Pal and Kakoli Pal may be considered the first three women to have broken the male monopoly among Kumartuli idol makers. They are the most prominent among the few peers they have. They had to be more hardworking than their male peers because it took a lot of time for their male colleagues to accept them within their fold. China’s life changed when her father, noted idol maker Hemanta Pal passed away in 1994. “Though my father did not like me to enter into this profession, I quit school and began to manage my father’s studio. Ironically, he had begun to train me under him a few years before his death,” she reminisces. China is popularly known as Dashabhuja Ma (10-armed goddess) among fellow artisans for her ability to multi-task. She manages her home and studio equally well. She is in her mid-forties now and has a team of 12 people working with her. “We work with cement, plaster, bronze and copper because public tastes are ever-evolving. A truckload of sand now costs more than Rs.2000 while wet clay is priced approximately above Rs.800 per truckload. Clubs and collective organizations that place orders for idols often slip up when it is payment time. Many of them scoot off when we ask for payment. So, I have settled for family pooja orders because they are very good paymasters in terms of time,” says China who has been in this business for the past 24 years and has gained a good name for herself. “I like to place Maa Durga and her entourage in the same wooden plank, and that’s how I make them, unlike others, who have fallen to new designer ways of making idols,” China says. “I have not fallen prey to capitalism; for me, my workers are all the same and when we are done with making idols, we all take a vacation and travel together in the month of November.” She follows her father’s school where the Goddess and entourage were ekchala – under a single roof. China has received the Rajyapal Puraskar. Among her well-known works is the ardhnarishwar idol of Shiva and Durga commissioned for Kolkata’s first transgender Durga Puja pandal in 2015. It was an androgynous sculpture for the transgender community, one of the first such idols in India. Media praised the radically different move. 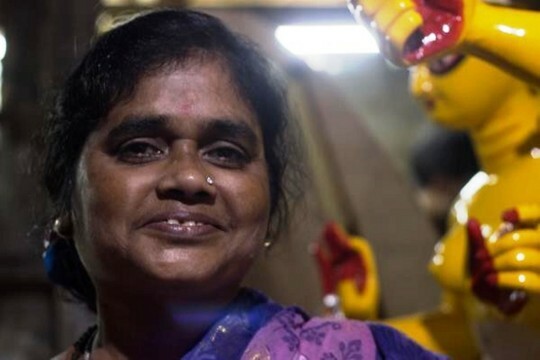 “We wanted a woman to make this idol for us so we approached China-di and she took it up without reservations and sculpted it personally,” says Bhanu Naskar, spokesperson of the transgender community. Mala Pal can be seen working at a jet-like pace to meet Durga Pooja demands, supervising her labourers, obliging photographers and tourists, and would look after her ailing mother who lived in a cramped room behind her studio in the potters' hub. 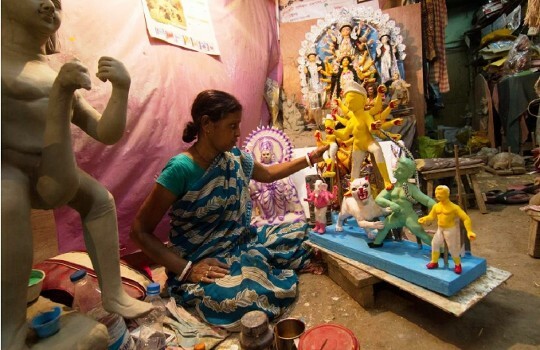 Mala, who has won several state awards for her craftsmanship, specialises in miniature, ‘foldable’ Durga idols that are exported to Europe, Australia and Canada where pujos are organised by the Bengali diaspora. This 47-year-old took over the reins of making idols when her father died in 1985 as her older brothers did not help and were not interested in carrying on this heritage. “I have gone through financial hardship, but now I have received some recognition and the business has been good,” says Mala. Every year, she decides that she will stop this business for good. “My workers are like my family and as soon as Saraswati Pooja arrives in January or February and orders begin to pour in, my adrenalin rises and I give up my resolution,” she says. Kakoli Pal does not have an exclusive studio space and shapes the idols inside a temporary, make-shift space in a narrow Kumartuli lane lined with shanties, public toilets and studios belonging to male artisans. All her appeals to the authorities for the allotment of a permanent space have received no response even on rent. “I did not get any financial help from the state government either.” Circumstances pushed her into this art and business when her husband died suddenly 13 years ago of a sudden brain stroke. “As I belong to Nadia district, I had no clue about this craft and when I was married to a Kumartuli idol maker, I became familiar with the art but only as an outsider. I have an average order of around 25 idols every year mainly for family festivals who are very good and regular paymasters. But the going is getting tougher every day because the price of raw materials and labour is going up sharply and as women artisans, we counter problems the men do not,” she says. “The studio has been my home of peace and creativity. I have expanded the business. My husband could barely manage to create five to seven idols, I have to deliver 22 idols of the Goddess this year,” she sums up. Kanchi Pal is one of the most sought-after new-generation artisans in Kumartuli, who offers tough competition to her male rivals in the trade. “My mother, Archana Pal taught me the art because she stepped into the trade when my father died.” She is a one-woman army—crafting the idols, supervising her labourers, and taking care of finance and the business aspects. “There is no difference between a male and a female idol-maker,” stresses Kanchi, whose husband works in Kuwait. “There are only five to six women artists in Kumartuli,” says Ranajit Sarkar, Secretary, Kumartuli Shilpi Samity. His list does not include Namita Pal who lives and works in Potopara near Kalighat which is like another Kumartuli in miniature. Shipra Ghodui and Shibani Pal have their work units in Andul, some distance from Kolkata. Alpana Pal specialises in making small idols for her Marwari clientele. She learnt it from her mother, Geeta Rani Dinda when she was just a teenager. She does not have a workshop and works from home. “My son studies at an art college and designs zardozi and bead ornaments for the decoration. “I picked up the skill from my shashuri maa (mother-in-law),” says another idol maker, Arati Pal. 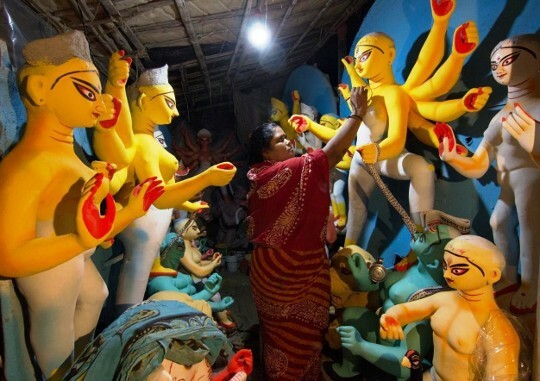 “Twenty years ago, there was just one woman artisan but today, there are around 10 who are totally involved in this profession,” says Babu Pal, a former secretary of Kumartuli Mritshilpo Sanskritik Samiti. Veteran artisan Dileep Pal says that males of the younger generation, including his son, are reluctant to enter the business. “It is a very good sign to see women take up the baton,” he adds. A few women also add their creativity as ancillary artists who support the bare bodied Goddess and her children. Parul Raeel hails from Nadia district and her marriage brought her to Kumartuli. She makes accessories like jewellery for the Goddesses with sequins, zardozi beads and small mirrors. “It takes me about three days to make a single set of jewellery for a Kali idol but the business side is taken care of by my husband”, says Parul. Nivedita is only fourteen years old. She excels in creating flowers out of pencil shavings that are used for decoration. She is training under her mother Shrabani Pal who makes small idols for the market. Minakshi Pal, who took up the trade in 2011 after her father died, says, “I took it to keep my father’s name alive.” That very year, she was scared about whether she would be able to supervise and deliver more than 20 idols. Time and experience has given her the confidence not only to carry on but also to expand. Each Durga ‘family’ takes around two months to complete and is priced in a range of Rs.10,000 to Rs. 2 lakhs. Orders from abroad must be completed and shipped by April-May mainly through reputed couriers. They are packed in plywood boxes shaped like cupboards and locked for security. China Pal, Kakoli Pal and Mala Pal were felicitated by P.C. Chandra Jewellers, Kolkata with a golden chain each and a tribute was paid in the form of a five-minute documentary on them called “Daughters of Clay” (Kanya Rupeno) streamed on YouTube recently. But a lot needs to be done. More women need to step into this predominantly male space not just because they are women but more importantly because they are creative, artistic, focussed and determined to carry the family flag across and ahead. “The image of Durga vanquishing the demon gives me constant courage,” says China with a smile.